An unusual ferris wheel along the Dotonbori is offering a great view of Osaka. The Ferris wheel, called the Ebisu Tower that named for the figure of the god Ebisu, located near the famous Glico Man signboard along the Dotonbori River, is offering a new view of the Dotonbori street and the skyline of Osaka city. 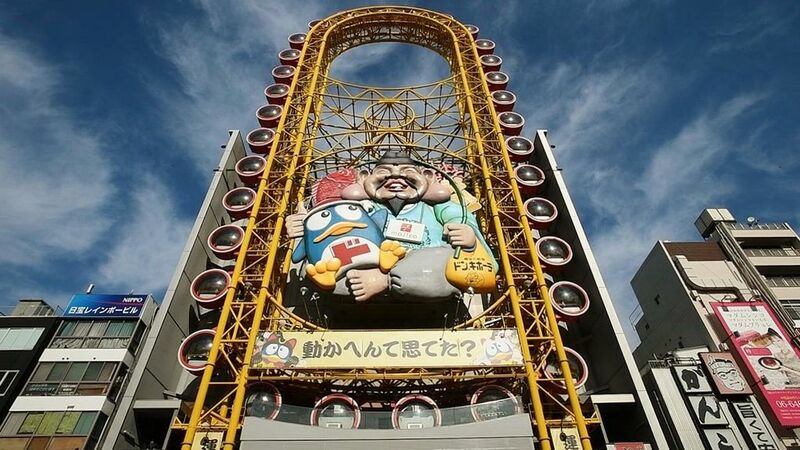 The biggest discount store group in Japan, Don Quijote is one of the landmark of the Osaka Dotonbori area. There is nothing you can not find in the store. Daily necessities, small items, jewelry, gadgets, tools. Not many people would have even noticed that Don Quijote’s yellow ferris wheel was an actual ride due to a long time suspension. After 10 years renovation work, It’s just reopened on January 19, 2018. ● A view from a gondola. The ferris wheel is 77 meters high with 32 gondolas that can accommodate 4 people each. It takes about 15 minutes to go around and offers a great view.